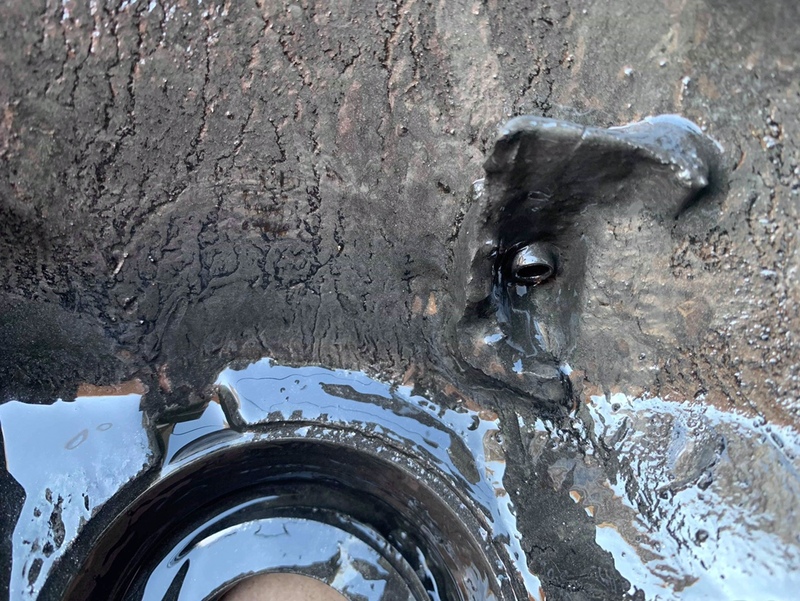 Can I hire a Drive hydraulic shaft puller? Discussion in 'OT (OFF Topic) Forums' started by brucemillar, Feb 3, 2019. My X5 (E53 - 4.8is) had a front drive shaft fail at the outer (hub) CV joint. This is a fairly common part and is considered maintenance. A few weeks previously the passenger side failed and was replaced in less than 30 minutes. Unfortunately we had to wait on a replacement drivers side part to be sourced, so could not do both at the same time. I called up my "usual" Mobile Mechanic, who I am rather dependent on, since I got sick. We agreed that he would replace the entire shaft (Hub to Diff). A new shaft arrived (£80+) and we were ready to go. 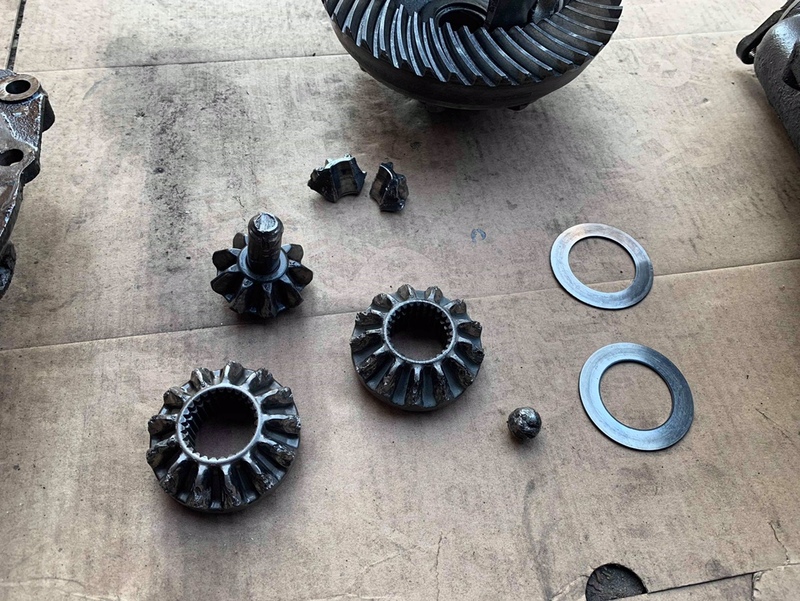 Two hours later my mechanic tells me that he cannot get the old shaft out of the diff? It is held in place by a "Slip Ring" and is removed by brute force which compresses the ring inside the diff. No amount of force will release it and we are stuck (literally) with the shaft in the diff. A pry bar between the shaft and the diff casing. A Slide Hammer on the hub end of the shaft. 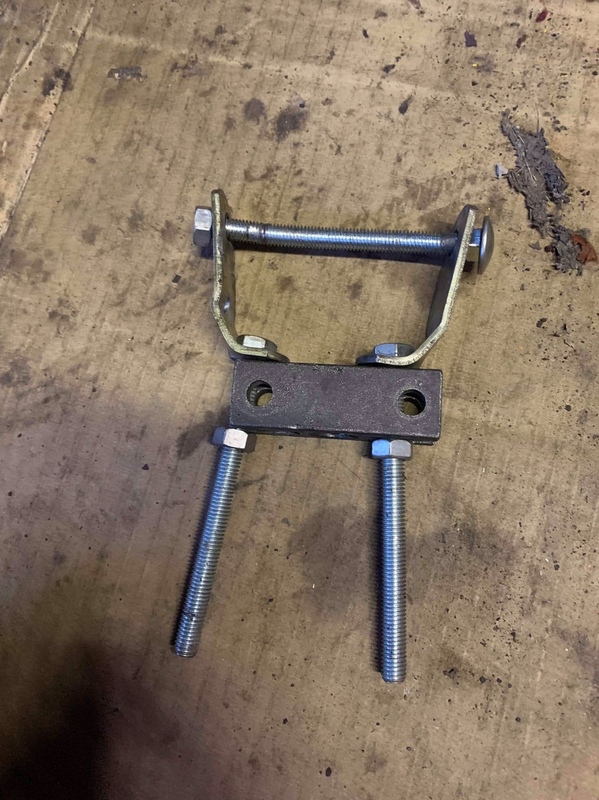 Fabricating a bracket that screws into two drilled holes, that my guy put into the shaft and inserted bolts to attach the slide hammer to. This just bent the fabricated tool. We are now in the process of making a stronger bracket in the hope that it will work. But I have little hope. I spoke to my friendly guy in the local BMW place. he tells me that this is a known issue and our order of removal almost mirrors theirs. They do not have a specific tools but use whatever they can make up when it is required. He did say he has never seen a diff break doing this?? Removing the other shaft and pushing a bar through, then whacking it, in the hope that it pushes the stuck shaft out. Dropping and dismantling the diff (this is a hell of a job) and not one he would want to try. I have attached a couple of pics of the bracket my chap made up for your perusal. Whatever we do, we do not want to break anything if at all possible. 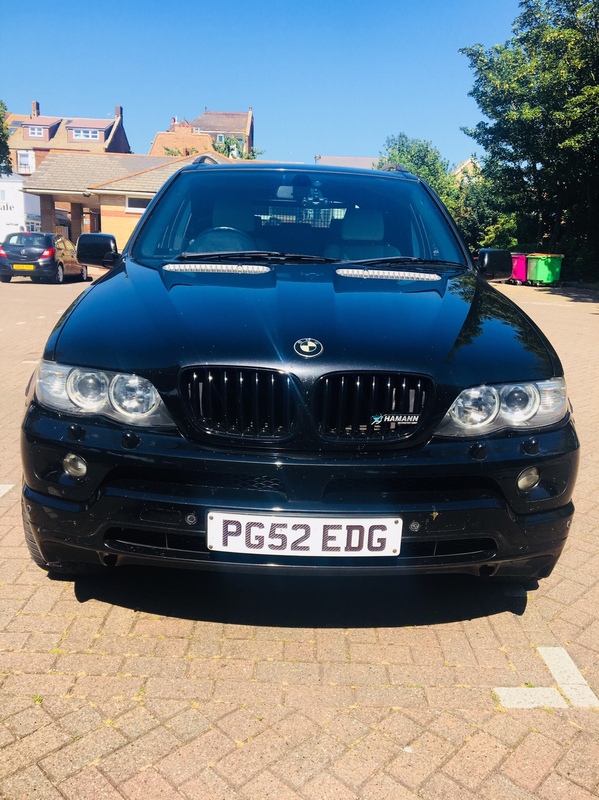 My other option is, bite the bullet and drive the car (I am told it can be driven gently) to my local BMW independent and pay them. They will not be cheap, but I need my car back. I spoke with them (above) and they are none to happy, as we have already played with it. Oh. 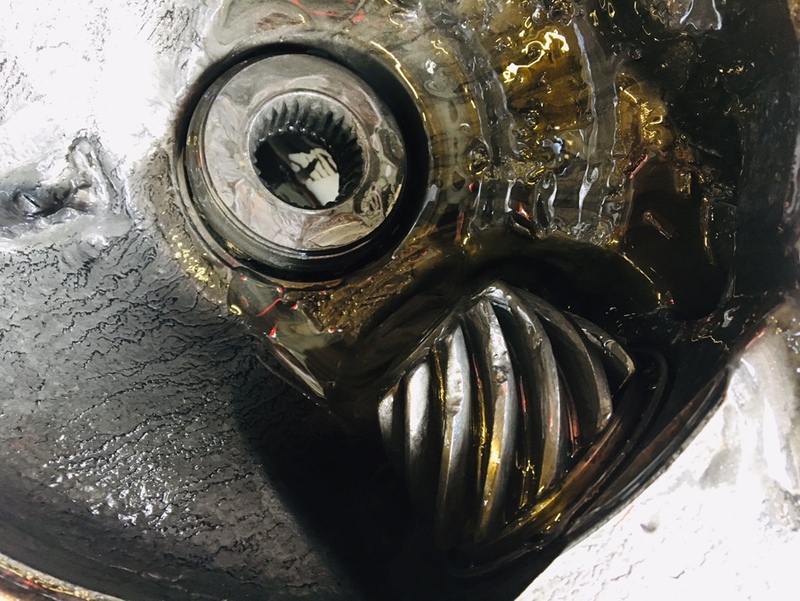 Leaving the diff end of the shaft in situ and attaching a new outer is not an option as my guy drilled holes in the inner end, so it will be weakened now? Any help, as always is greatly received and appreciated. How about a longer pry bar ? Like putting a scaffolding pole over the short one ? Or not feasible to get in with it ? Maybe somewhere like HSS hire centre would have something? Another thought ... are you friendly with anyone at your local fire station ? or could something like this be of use ? If you do a search for hydraulic, Machine Mart have quite a lot of stuff . Years and years ago, I made a tool for pulling driveshafts out of FWD diffs. I can not even recall for what vehicle I made this and it is still somewhere down my cellar back home. Please do not laugh at my drawing, I did manage 4 /100 for Technical Drawing at school. Anyway, it is a simple heavy duty plate with a round cut out and with some round bar welded on to provide a fulcrum point. Slip the round end under the drive shaft, and whack the other end with a 4lb hammer until the shaft capitulates. I may well have put some more steel plate under the fulcrum to protect the diff, too long ago now to remember. CCAALLVVIINN, grober, brucemillar and 1 other person like this. I like your drawing(s). I love the video. It looks from the video that the sharp crack shocks the clip. That has to be the way to go. I have sent your post and link to my mechanic. We will try and see how it goes. Thanks for looking, reading and replying. Just what I needed. Thanks for your help. Fireman’s spreaders would probably do. But it does look like a sharp shock over a gentle spread my work better? Further to my rantings above, here are some proper Drive Shaft removal tools, the one on the right being for SAABs (200 Euros for that one !). 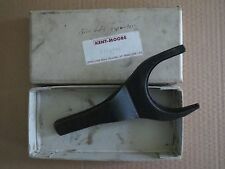 The other are USA made, Kent Moore. I confirm that it is a short sharp shock that frees off the driveshaft, rather than a slow pull. I know my lash up tool does not look much like the proper ones --- but it worked. Many thanks for your help here. Things got better then a whole load worse. 1). Using Toolmans video with the Chain & Wrench the shaft popped out first time & with the old slip ring still on the shaft. Delight,exhuberation, hugs and back slaps. 2). Problem we can see that something? Has dropped inside the diff stopping the new shaft sliding in. Whatever it is floats about but should not be there. We now believe it is a planet gear? 3). So now I have had to order up a second hand diff from eBay. Big money. 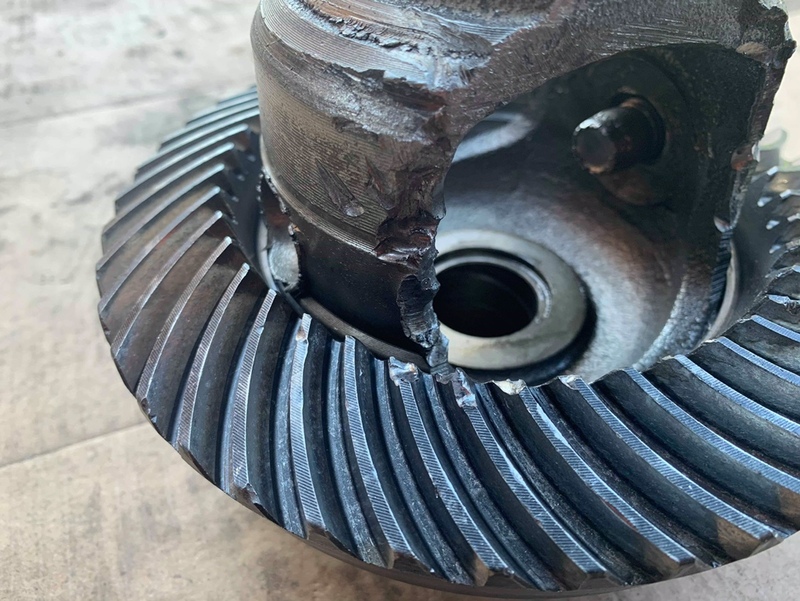 Dropping and opening the old diff to find what is broken will not help me here. I think it’s probably busted a gear or a bracket or both. I have no idea what holds these gears in place. So we will replace the entire diff in one hit in the same day. It’s that or give up. I’m not about to give up as it’s a great car. The innards! only one pic available sorry. So today we finally got the “replacement” diff ready to go in the car. 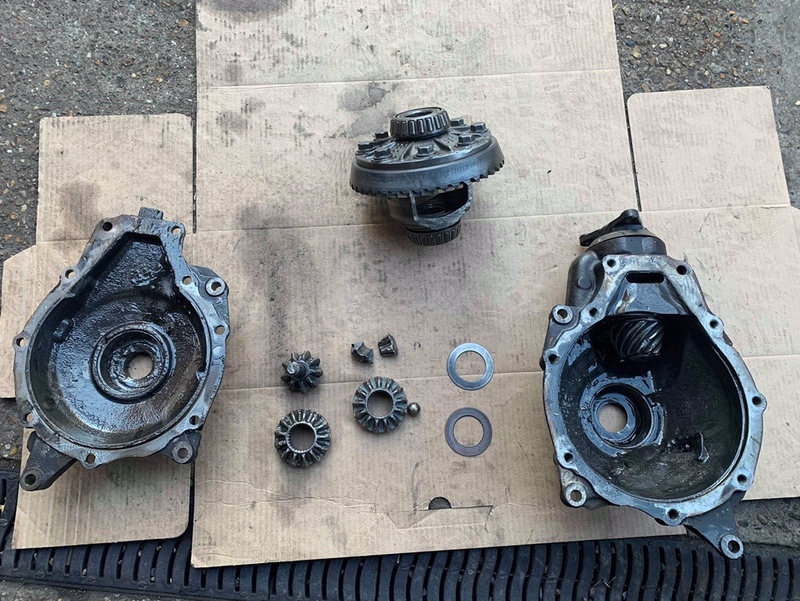 We also were able to remove and strip down the existing diff (or what is now a box of bits that used to be used as a diff). 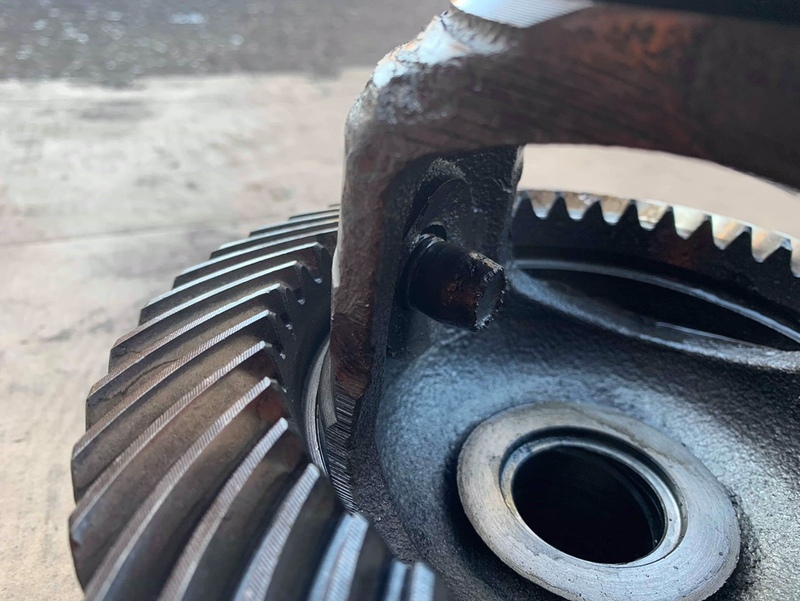 What we can see is that the planet gears have seized then exploded smashing the innards of the diff casing and most of the physical gear teeth. It’s the worst I have seen, ever. It it really is bad folks. I have attached some pics that do not do it justice. 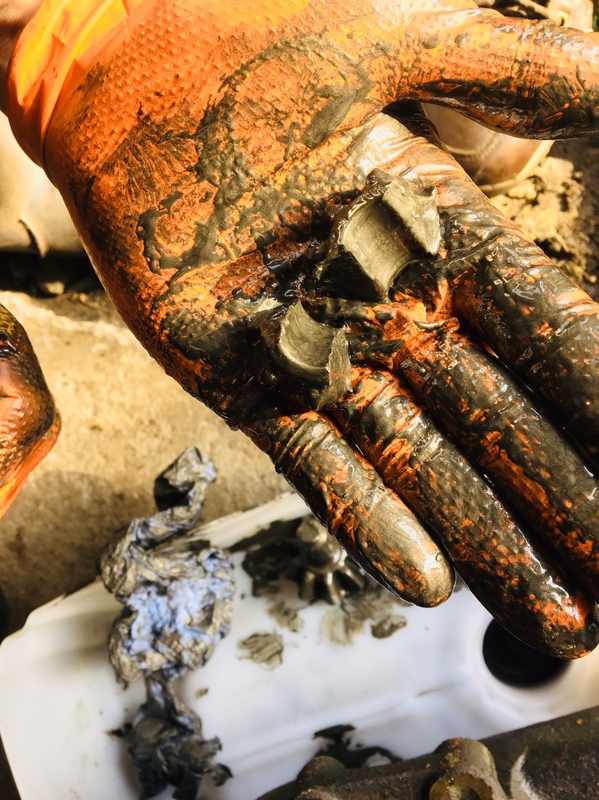 The grey sludge is GEAR OIL (ho ho ho) and metal paste. We are now reassembling. Fingers crossed folks. Smashed gears as the dropped out the case. Even more crushed and smashed diff gears. What we want to get back to today. Hope all goes well, my Son had one, was the biggest money Pit I have ever know and I have had a Jeep (Just Empty Every Pocket)Lol, I begged him to get shot and after another large bill he finally did. Well it's all back together now and running as it should. 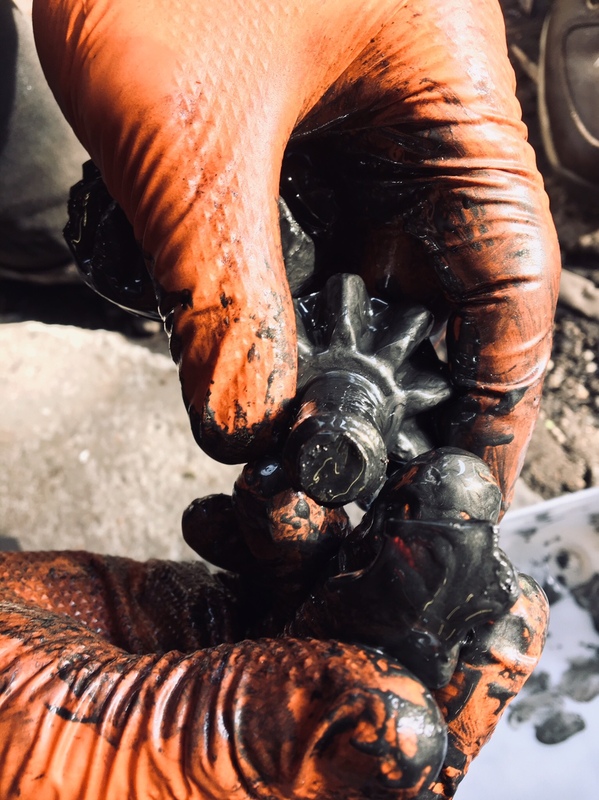 It's good that we did not require a magnet in the transfer case to search out any metal particles :^) some of the lumps were fist sized (that was not a joke). The new/replacement box from an BMW ebay seller in Lithuania was/is as good as what was promised. We could see it had been vleaned and refurbished. A quick sping up on the bench revealed zero whines, groans or bearing wobble. So that was a huge relief. In fairness, the seller did state up front, he would happily refund my money if I had "any issues at all" with the unit. Based on that and the rarity of the piece I did not haggle too much on his "best offer" price. I got £40 off of that and was happy to take it. I would have paid full price. The actual unit was direct swap out/in as we were told it would be. The ratios were correct for the car and there were no issues with any fittings or fitment. Once again I find myself (like many) indebted to my great friend on here - fellow member GROBER (Graeme) who gave his time and expoertise to seach out correct ratios and fitting. When you have Graeme batting on your side you are on a winner before you get started. It gives you the confidence that you are buying a hugh value item from a foreign country, but that it will (if as described) fit as stated by the seller. It was not straight forward as there are four potential fitments here. A 3.0d Manual, and 3.0d Auto. Then a 4.8 Manual and Auto. Then we have to ensure that we buying the correct 3.91 ratio(s). Graeme got it spot on first time and took all the stress out of buying the transfer box. He also (along with others) provided photographs of the interior of the transfer case so that we could see what (if anything) Was broken. As as you can see it would have been easier to look for what (if anything) was NOT broken. The events leading up to the failure, look to have started, with a small differential oil leak that I never spotted (bugger). 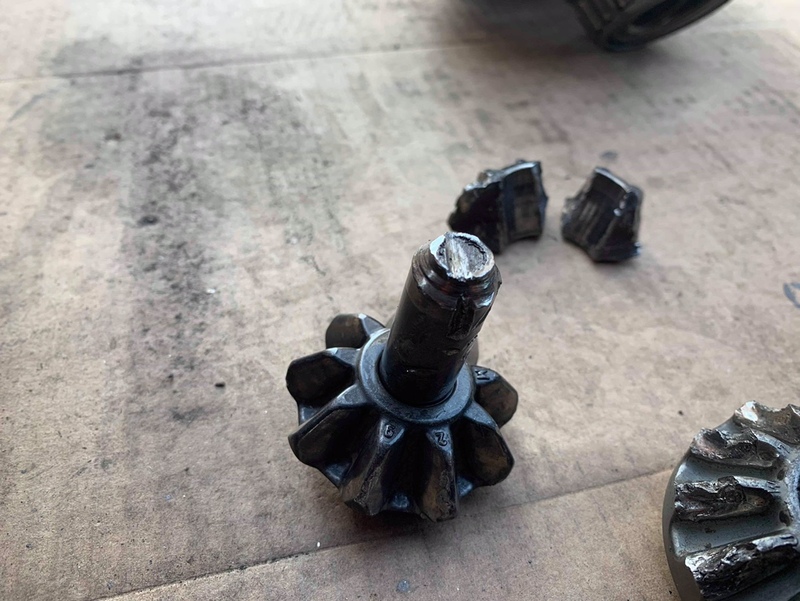 Add this to to a failed Inner CV joint on the drivers drive shaft (it actually exploded) caused the box to seize and jam the inner slip ring and shaft inside the differential casing. NB: If you have spit CV Boots, now you now why the MOT flags them up. Ignore them at your peril and expense. The giveaway is usually a trail of grease circling around your wheel arches or inside the actual wheel rims. I knew my CV had split three weeks before. We ordered both sides but were waiting on the drivers to arrive when it let go. I should have left the car in the garage while we awaited a new CV Shaft. For £80 I have multiplied my expenses by some margin and needlessly. At that point we were goosed. 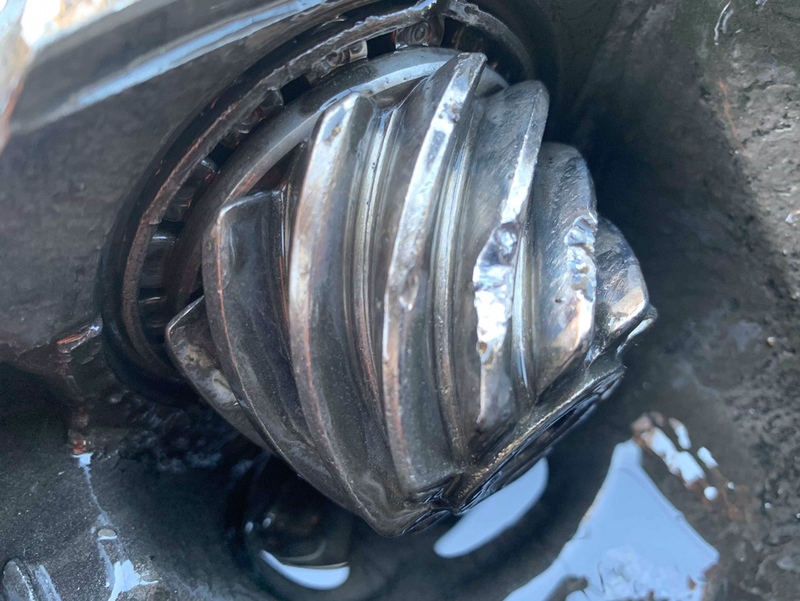 Removing that shaft from the differential with the slip ring jammed is almost impossible unless you have the intimate knowledge that these forums can provide. 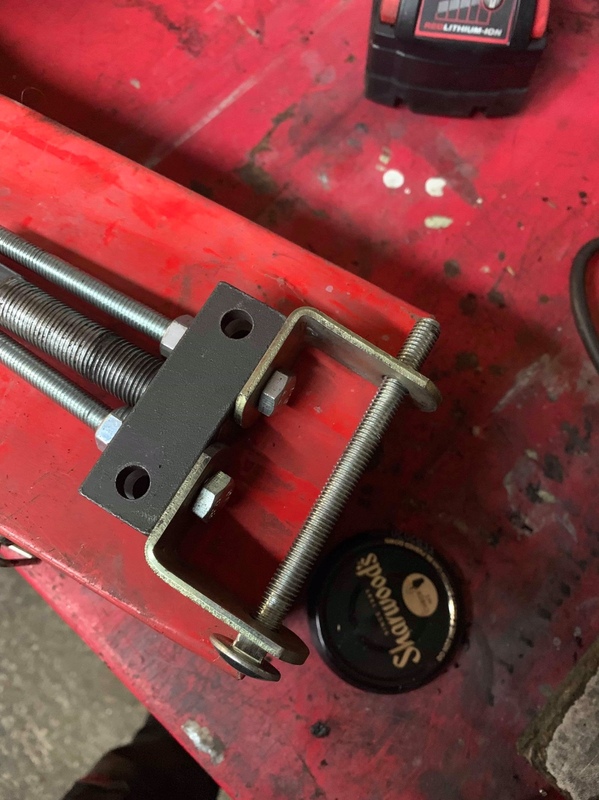 Thanks here have to go Toolman (Steve) who provided a fantastic video of a chap in the USA using a homemade adaptor, attached to long chain and then a slide hammer to "shock" the shaft into releasing the slip ring. Shock was the absolute trick here I am indebted to Steve for providing that. I can tell you now that we would be cutting open diff casings without it. FYI. using that method (took seconds) after we had spent weeks and broken two slide hammers and three sets of stilson wrenches. BMW tell me that this is not a world record. You can use this method on all sorts of situations and vehicles!! Thank you again Steve for your absolutely brilliant find and share here. Re-assemble went well with no hitches. My mobile mechanic came armed for battle with an engine hoist ramps and jack stands. he was able to lift the engine 8" and provide the necessary clearance to wiggle the transfer case past the engine and steering etc. So she is back on the road with no noises, groans or leaks that I can see (so far). A fabulous team effort from the virtual team on here. To anybody I missed off thanking? My apologies you have all been a great help. My health is shot now and my days of heaving big lumps of cars around are behind me. Without the help from here I simply would not manage. So take a bow folks. You deserve it. Also note just how powerful the forum is when it comes to things that are not all Mercedes related. Mostly. Have fun. Have a great weekend and enjoy. To you and yours. from me and mine. Good health. Gollom, toolman1954, clk320x and 8 others like this. Another excellent write up and proof that the Forum is, on the whole populated by knowledgeable, well informed and helpful people! Gollom and brucemillar like this. Okay friends. Here is a full set of pics taken today if the front differential AFTER it has been cleaned up. It leaves nothing to the imagination but shows you eat can happen when metal gears run out of lubrication under load. I say it again with no apology. 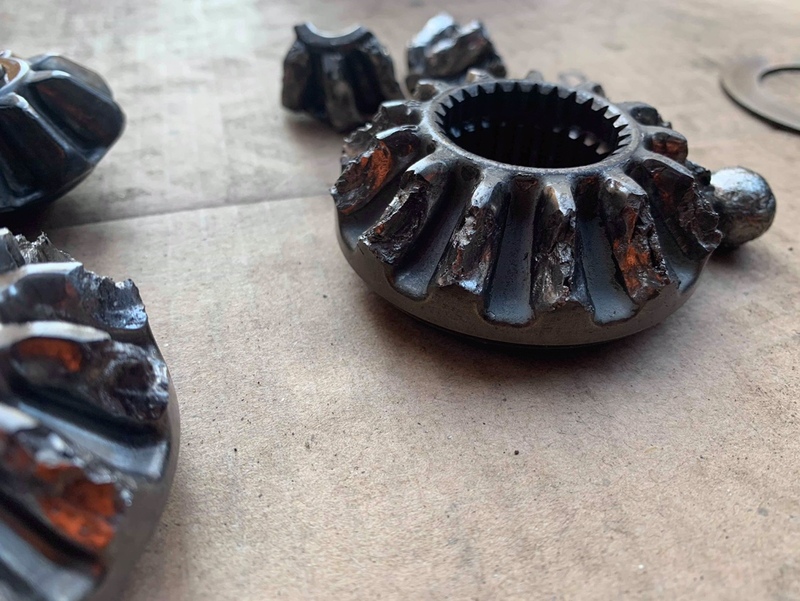 If you have any suspicion that your CV joints or Diff(s) are dry? 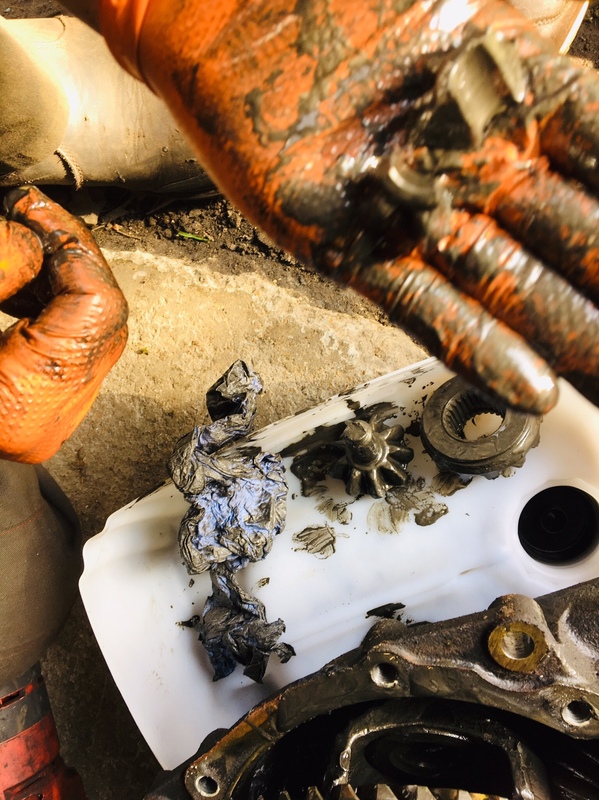 Get them checked and repaired/refilled with the correct oils & grease. I am not being over dramatic here, when I say this could have had very serious consequences. All of which are down to me taking chances. Stupid boy. I got away with it just losing lots of money. I could have lost a whole lot more. Any questions. Ask away. It’s not a Mercedes but the principle is the same. The last pic, shows the diff oil as it came out with the same consistency as treacle. Basically it was a metalised paste. 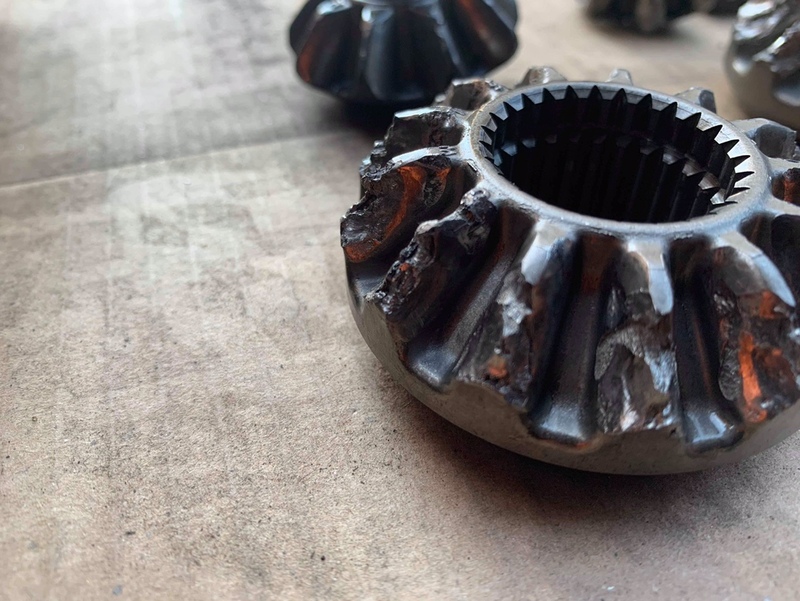 Bruce, looks very like something has happened to the cross shaft that normally holds the 2 planetary [ spider] gears in place in the differential carrier allowing them to drop out of mesh with the drive shaft gears and the diff crown and pinion got mangled on the resulting fragments in the process. That would point to a drive shaft problem rather than a propshaft problem . But who knows???? here's a good pic of that cross shaft in a rear diff- this one is in one piece! 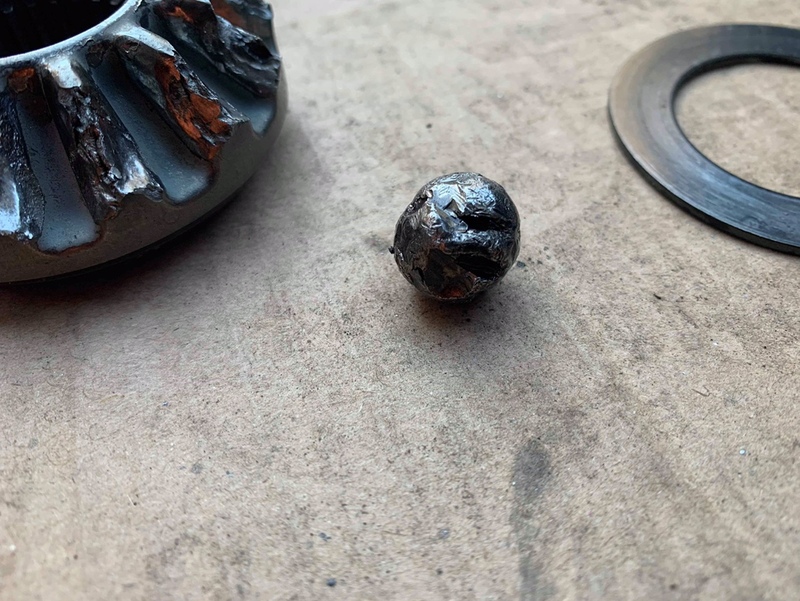 That is an awful mess, some long time since I have seen a catastrophic failure as bad as that, and in my days, for cars and bikes, I have seen gearbox failures and engines that have put a leg out of bed, resulting in bits of shrapnel everywhere. You have to be thankful that the transmission did not seize up completely whilst the vehicle was being driven. 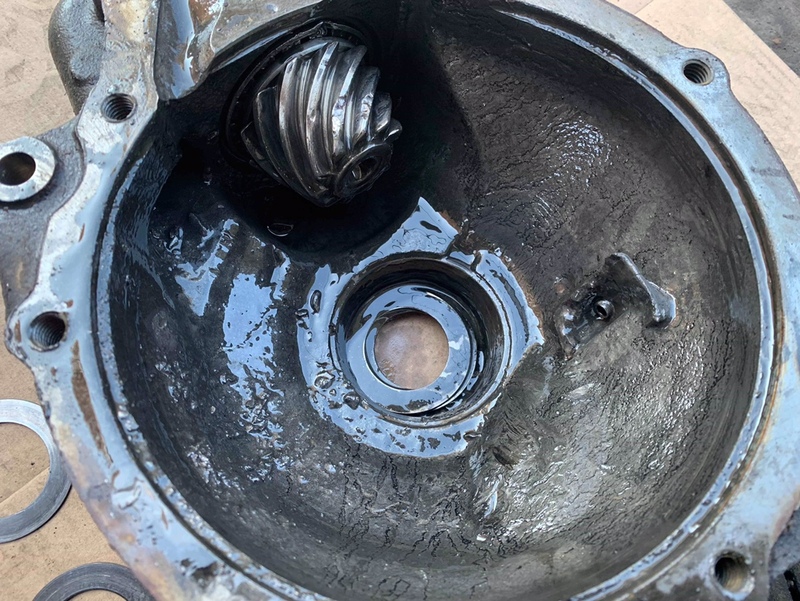 Day after day, millions of cars have engines and gearboxes whirring away at some immense RPM and thankfully it is very unusual for immediate terminal failures to happen, providing of course,everything gets suitable lubrication.! Perhaps you should put the pieces in a suitable display box and hang it on your workshop wall. Some might of course, call this , "art". All is well that ends well. Another saga in the day of the life of Bruce. You can not make these things up. Regards. It looks worse in the flesh. I am counting my blessings that we did not get pitched off the road as the box seized. It happened in stages hence I was “lucky” to get away with no more than broken metal. 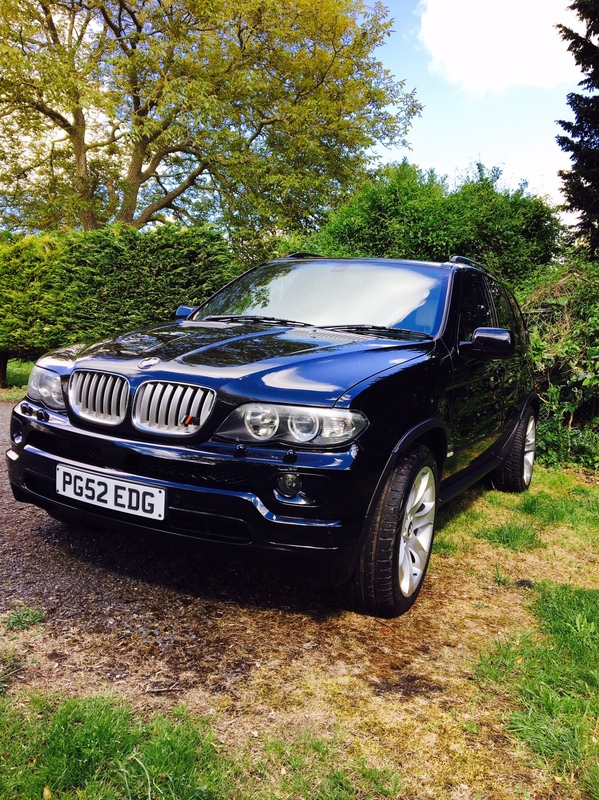 Looking at the X5 forums, I am certainly not alone. 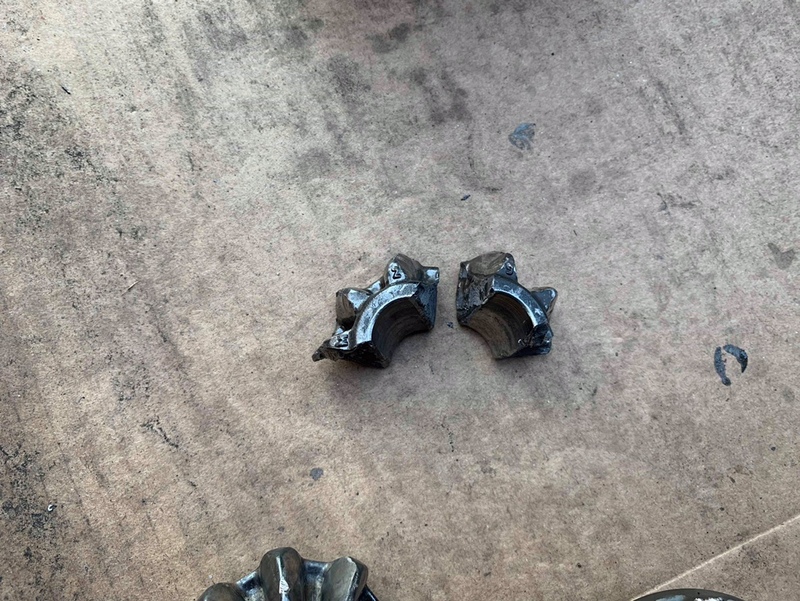 The main lesson being that the CV joints are maintenance items and must be not be left. When the passenger side went AWOL I ordered up replacement shafts for both sides. The plan was simply to replace the whole lot in one hit. Now the folks doing the work at that point in time were only able to source one shaft, which was replaced. I went into hospital and promptly forgot about the drivers side until I escaped back home. I’m annoyed with me. I should have not used the car and got it fixed properly day 1. There are no corners to cut with the drive train. Taking that chance was stupid. All done now with only my pride and wallet hurt. So what is being said here - that the CVs failing destroy the diff? (Inability to articulate due to stiffness overloading the pinions into which they sit which in turn overload the pinions carried in the diff cage until the whole lot fails catastrophically - is that it? In this instance we could see that the drivers side CV joint had run dry (split boot) and then come apart at the joint. That failure, we are assuming, damaged the slip ring and probably pulled the diff apart inside. Again we could see that the drivers shaft had tried to pull itself out of the diff allowing the diff oil to escape. There was a good coating of diff oil over the underside of the car and the engine bay. You could smell it burning on the manifold. 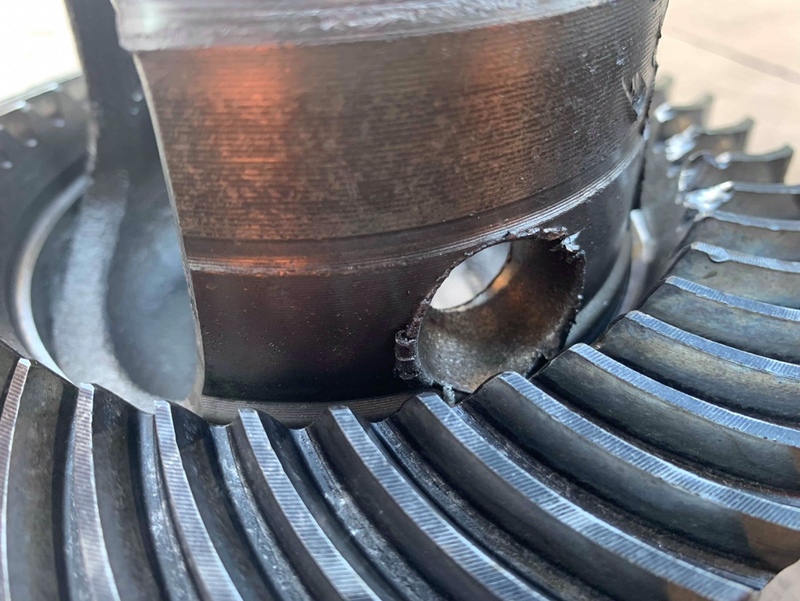 The final straw was (however it happened) a diff with a shaft flapping around freely inside it and smashing up the gearing. It is speculation as we did not see it actually happen. But I felt it going in various stages and should have given up. The other theory is that in trying to get the shaft out we smashed the diff. I don’t like that as the once we started trying to remove the shaft, we did not drive the car for fear of damaging the wheel bearings etc.